I am one of the founders of Tendr, a company that provides a simple way to give money as a wedding gift, and I am sometimes asked if cash is an appropriate gift. The answer is yes, but rest assured, we did not invent the idea of giving money as a wedding present. We developed our business to bring a digital solution to a timeless practice almost as old as the institution of marriage, which has been traced back to wedding bands excavated from Egypt and dated to 2800 BCE. Many things have changed in the intervening 4,000+ years, but not everything; we’re still using rings in our ceremonies. Just as a variety of different traditions lead to and inform the joining of two people in marriage (and if they are from different backgrounds, this variety can be especially wide), so too are there different proud customs attached to the gifts of money that accompany weddings; some are related to the amount, others to the delivery system. They are always steeped in many years of tradition. In America, a story has been developed by self-styled etiquette experts; this story relies on outdated ideas about marriage and weddings. Although these “experts” are often people who would describe themselves as traditionalists, they sometimes claim that cash is a gauche or tacky wedding gift. I believe it is thoughtless and senseless to accept this conclusion without looking at how many people around the globe and here in the U.S. believe the opposite to be true. Most people have traditions that point them away from the notion that a cash gift is in bad taste or unwanted. If there was ever a time to deride such a gift, it has surely passed. With the histories, traditions and customs of all of the world’s cultures and religions readily available for examination on our wireless devices, it is beyond shortsighted to focus only on the relatively narrow and hegemonic view of the laregely white, British, former ruling class, from which almost all etiquette experts are produced. As a proud supporter of multiculturalism, the U.S. is home to many blended ideas about being together, including in marriage, and in the 21st century we should not be surprised to find that old ideas are being updated in contemporary weddings, including the giving of cash as a present. In Thailand, China, Japan and other Asian countries, monetary wedding gifts tend to come in decorative envelopes of a prescribed type. The Hindu, Jewish and Buddhist traditions favor certain numbers for monetary gifts, each chosen because of lucky attributes associated with the number. Cash gifts at a Jewish wedding are often in a multiple of 18, and at a Hindu wedding the amount ends in 1. The belief that the gift should be an odd number is also prevalent in Japan, China, and Vietnam. 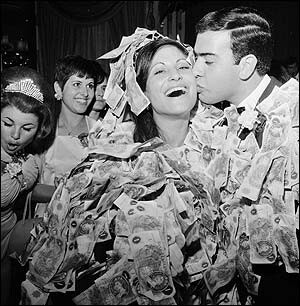 In some cultures it is customary for wedding guests pin dollar bills to the bride’s dress. In Italy and in Nigeria, brides carry bags at the reception that are filled with envelopes containing checks or cash by the wedding guests. Certain cultures have traditions where anyone who dances with the bride gives her money (in some cases pinning it to her dress). Across nationalities and religions, the gifts that people expect to give (and hope to receive) as wedding presents are informed by history and culture. And for two people about to begin a lifelong journey together, cash has a versatility that can supersede other gifts. When a wedding guest gives cash they are saying, “I trust you, whatever you decide to do with this.” It is a truly powerful gift. If you look online for wedding gift ideas, you will find that many people today are saying that cash is more popular than ever. This is true because couples are getting married later, have wider friend networks, and desire unique experiences. Demographers go on to say that what people need to start their home is very different today than it was fifty or even thirty years ago. I can tell you that we see people on Tendr doing everything from saving up for a house, going on a big honeymoon, and buying a full complement of new electronics. Many others, saddled with enormous student loan debt, are using their gifts to help clean their financial slate and start fresh. Cash is not new. It is a very traditional gift. The only requirement is that it be given thoughtfully. While it can be nice for newlyweds to tell guests what they intend to do with their gifts, it isn’t necessary. Wedding guests for thousands of years have enjoyed the little bit of magic that happens when they give someone the beautiful gift of money with no strings or expectations attached. The possibilities are endless and everyone gets to dream a little bigger. At the very least, wedding guests know that the couple will put it to good use — therein lies the leap of faith that can easily be called generosity. It’s confusing then, why some “etiquette experts” fail to see beyond their own narrow experience. Sure, monetary gifts may not have been the norm in your family or community. But to give advice that doesn’t take into account another person’s rich, long-standing cultural tradition is to give irrelevant advice. In any case, it certainly isn’t polite. CEO of Tendr, delivering generosity via the webs.